The project is made possible with the financial support of the Cultural Programme for the 2018 Bulgarian Presidency of the Council of the European Union of the National Culture Fund, under the authorial project of Irina Genova, designed by Nadezhda Lyahova. The entire execution includes an exhibition and a catalogue. The exhibition, a concept intended for outdoor exposure, will be held from 3 April to 3 May 2018 in Sofia, at the National Gallery – Sofia Arsenal – Museum of Contemporary Art, and in the second half of May 2018 in Florence, at the Academy of Fine Arts. to combine artistic and educational impact. Italian Futurism, which generated interest and stirred excitement between the two World Wars in Bulgaria, is intertwined with other artistic phenomena. The exhibition shows different artistic practices which relate to Italian Futurism. The reproductions of art works, photographs and documents reveal the Bulgarian connection with the networks of the avant-garde, among which Futurism had a central place. The trans-border contacts have been visualised in the schematic maps in the lower part of the panel. Nicolay Diulgheroff’s figure, an artist from Bulgaria, who settled down in Turin in 1926, his artistic work in the milieus of Futurism and his contacts with colleagues from his mother country are the focal point of interest. 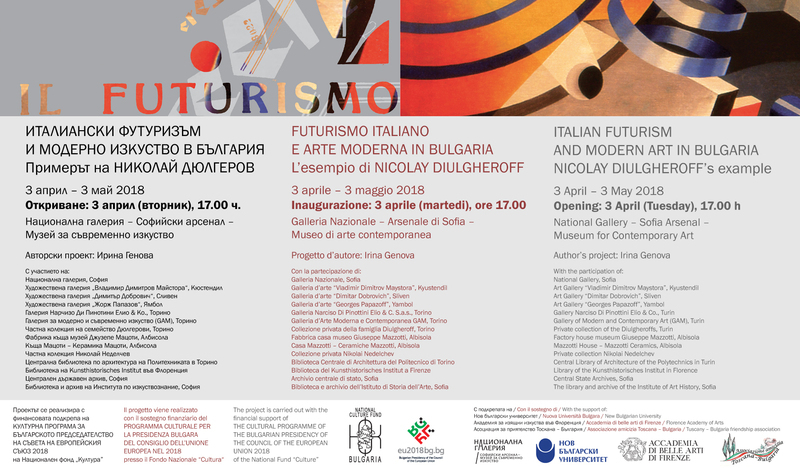 The topic of Italian Futurism and modern art in Bulgaria poses two difficulties. One of them, in the field of form and style, is common in Bulgarian culture and lies in the hybrid nature of different tendencies. The other one relates to the history of art beyond our borders and is connected with the political fate of Futurism in Italy, namely its connection with fascism from the middle of the 1920s onwards. The project – an exhibition and a catalogue – does not avoid discussing them.